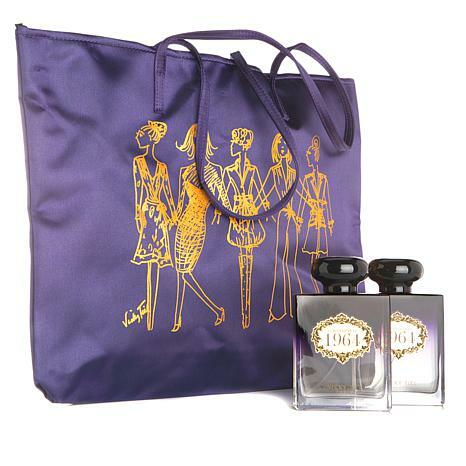 This set contains a duo of the enticing Vicky Tiel fragrance 21 Bonaparte 1964, plus a distinctive, chic tote. Ingredients: Alcohol Denat., Fragrance (Parfum), Water (Aqua), Citric Acid, Triethanolamine, Benzyl Salicylate, Limonene, Alpha-Isomethyl Ionone, Linalool, Citronellol, Coumarin, Citral, Benzyl Benzoate. Just didn't like the way it smelled on my skin. Returned. Nice bottle & bag. But the perfume was pretty bad. Sent the scent back.